Molton Brown Distinguished Treats Cracker, 6.8 oz. Molton Brown MBC804 - Hidden in delicate tissue lies a surprise of four distinctive bath and shower gel fragrances, curated from the world’s most inspiring destinations. Magic-filled boxes wrapped in sparkling ribbon, ready to reveal curious infusions hidden inside. The surprising spirit of Christmas, brewed with a bang! Intoxicating poofs of scented glitter swirl through a merry middlemen of festive aromas. Add it as a sophisticated finish to your table settings or pop it in his stocking this festive season. Includes:50ml subhuman body wash50ml coastal cypress & shower gel50ml re-charge black pepper Bath & Shower Gel50ml Tobacco Absolute Bath & Sea Fennel Bath & Shower GelEXPLORELondon via The Festivities Make joyful mayhem in the Molton Brown Christmas Distillery. Molton Brown MBC803 - Nestled in delicate tissue lies a surprise of four beautiful bathing fragrances, curated from the world’s most inspiring destinations. Lend the most flawless finish to table settings or stockings this festive season. Include50ml fiery pink pepper bath & shower gel50ml rosa absolute bath & star anise bath & shower gel50ml Dewy Lily of the Valley & Bergamot Bath & Shower Gel50ml Orange & Shower GelEXPLORELondon via The Festivities Make joyful mayhem in the Molton Brown Christmas Distillery. The surprising spirit of Christmas, brewed with a bang! Magic-filled boxes wrapped in sparkling ribbon, ready to reveal curious infusions hidden inside. Intoxicating poofs of scented glitter swirl through a merry middlemen of festive aromas. Molton Brown Mesmerising Oudh Accord & Gold Festive Bauble, 2.5 oz. Molton Brown Re-charge Black Pepper Bathing Gift Set, 26 oz. Molton Brown Festive Bauble Gift Set, 16 oz. Molton Brown Muddled Plum Festive Bauble, 2.5 oz. Molton Brown Stocking Fillers Christmas Gift Collection, 17 oz. Molton Brown Fabled Juniper Berries & Lapp Pine Liquid Hand Wash, Fine, 12.4 oz. Molton Brown - Magic-filled boxes wrapped in sparkling ribbon, ready to reveal curious infusions hidden inside. Intoxicating poofs of scented glitter swirl through a merry middlemen of festive aromas. Infuse your hand care ritual with rare white truffle and fruitful aromas, in this rich hand care gift set. The surprising spirit of Christmas, brewed with a bang! Instantly absorbed daily treats leave hands feeling delectably soft and luxuriously moisturised. Includes:40ml delicious rhubarb & rose hand cream40ml alba white truffle Hand Treatment40ml Orange & Bergamot Hand CreamEXPLORELondon via The Festivities Make joyful mayhem in the Molton Brown Christmas Distillery. Molton Brown Divine Moments Bathing Gift Set, 48.1 oz. Molton Brown Purifying Shampoo with Indian Cress, 10 oz. Molton Brown NHB037 - Heart notes: coriander, basil and violet leaf. Conquer the adventure with our iconic fragrance. Loose rubble tumbles into deep gorges, shot through with streams. Base notes: vetiver, oak moss and ambergris. Experience revitalise your morning shower with this body wash – a luxurious addition to your post-workout routine. A warming bath and shower gel filled with heated notes of black pepper, aromatic coriander and vetiver. Fragrance family: via Madagascar The off-road trek from mountainous Masaola to a savannah grass canyon. A spice-spiked breeze kicks heated earth. Benefits a blend of adventurous, cultivated notes leaves skin feeling deeply cleansed and scented with spicy fragrance. Molton Brown Bath & Shower Gel, Re-Charge Black Pepper, 10 oz. - The fragrance Top notes: black pepper, lemon and ginger. Molton Brown Body Lotion, Re-Charge Black Pepper, 10 oz. Molton Brown Purifying Conditioner with Indian Cress, 10 oz. Molton Brown Volumising Shampoo with Kumudu, 10 fl. oz. Molton Brown Muddled Plum Bath & Shower Gel, 12.4 oz. Molton Brown Volumising Conditioner with Kumudu, 10 fl. oz. Molton Brown Aroma Reeds, Black Peppercorn, 5 fl. oz. Molton Brown MBC807 - Magic-filled boxes wrapped in sparkling ribbon, ready to reveal curious infusions hidden inside. Awash his senses with a collection of unforgettable, exploratory aromas. Includes:300ml coastal cypress & shower gel300ml tobacco absolute bath & shower gel300ml Re-charge Black Pepper Bath & Sea Fennel Bath & Shower GelEXPLORELondon via The Festivities Make joyful mayhem in the Molton Brown Christmas Distillery. Intoxicating poofs of scented glitter swirl through a merry middlemen of festive aromas. The surprising spirit of Christmas, brewed with a bang! A charismatic trio of bath and shower gel fragrances to deeply enhance his cleansing ritual. Molton Brown Lime & Patchouli Fine Liquid Hand Wash, 10 oz. MBC805 - Treat them to an enticingly decadent array of pampering moments this festive season. Includes 10 x 1. 7fl oz. The ultimate curated bathing gift set, elegantly presenting an iconic collection of Melton Brown’s luxury bathing fragrances. Bath & bergamot heavenly gingerlilyfiery pink pepper rosa absolute russian leather coastal Cypress & Sandalwood Orange & Shower Gel: Coco & Sea Fennel Infusing Eucalyptus-charge Black Pepper Tobacco AbsoluteEXPLORELondon via The Festivities Make joyful mayhem in the Melton Brown Christmas Distillery. The surprising spirit of christmas, brewed with a bang! The ultimate curated bathing gift featuring 10 of our most-loved fragrances, elegantly presented in a festive gift box. Intoxicating poofs of scented glitter swirl through a merry middlemen of festive aromas. Magic-filled boxes wrapped in sparkling ribbon, ready to reveal curious infusions hidden inside. Molton Brown Delicious Rhubarb and Rose Body Wash, 10 oz. Molton Brown Glossing Conditioner with Plum-Kadu, 10 oz. Molton Brown MBC810 - Re-charge black pepper body scrub barEXPLORELondon via Madagascar The off-road trek from mountainous Masala to a savannah grass canyon. Base notes: votive, oak moss and ambergris. Includes:10fl oz. Heart notes: coriander, basil and violet leaf. Heated black peppercorn oil, fresh coriander and basil feature in this adventurous bathing gift set. The fragrance Top notes: black pepper, lemon and ginger. Re-charge black Pepper Body Wash8. 8 oz. A spice-spiked breeze kicks heated earth. Gift him to an iconic bath and body scrub duo full of spiced aromas. The ultimate curated bathing gift featuring 10 of our most-loved fragrances, elegantly presented in a festive gift box. Molton Brown Re-charge Black Pepper Bathing Gift Set, 26 oz. - Conquer the adventure with our iconic fragrance. Loose rubble tumbles into deep gorges, shot through with streams. 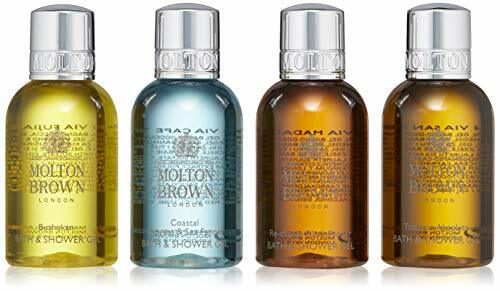 Molton Brown MBC802 - Treasure or treat with this curated collection of ornamental alluring aromas. Includesmuddled plum festive bauble fiery pink pepper festive Bauble Frankincense & Allspice Festive BaubleEXPLORELondon via The Festivities Make joyful mayhem in the Melton Brown Christmas Distillery. Magic-filled boxes wrapped in sparkling ribbon, ready to reveal curious infusions hidden inside.
. An irresistible trio of baubles, aglow with lingering, spiced bathing fragrances. Intoxicating poofs of scented glitter swirl through a merry middlemen of festive aromas. The surprising spirit of christmas, brewed with a bang! The ultimate curated bathing gift featuring 10 of our most-loved fragrances, elegantly presented in a festive gift box. Molton Brown Festive Bauble Gift Set, 16 oz. - An irresistible trio of baubles, aglow with oak-aged rum, fiery pink pepper and warming allspice in our most intoxicating bathing fragrances. Molton Brown - The ultimate curated bathing gift featuring 10 of our most-loved fragrances, elegantly presented in a festive gift box. Honey-gold sun prisms in a downpour of warm rain. Rare resinous heartwood, dense and dark. Base notes: Oudh, votive and honey. Explorelondon via Assam canopy of evergreens sloped along the mountain. Heart notes: elemi, myrrh and black tea. An irresistible trio of baubles, aglow with oak-aged rum, fiery pink pepper and warming allspice in our most intoxicating bathing fragrances. The fragrance Top notes: cinnamon leaf, nutmeg and bergamot. Decadent oudh accord, gold flakes and cinnamon leaf oil. Explore the steamy depths of a spiced forest. Molton Brown Mesmerising Oudh Accord & Gold Festive Bauble, 2.5 oz. - Treasure or treat with this irresistible ornament aglow with our opulent bathing fragrance. JACK BLACK – Beard Oil – PureScience Formula, Helps Prevent Dry, Itchy Skin, Fast-Absorbing Natural Oils, Lightly Scented with Botanicals and Essential Oils, Certified Organic Ingredients, 1 oz. Molton Brown Vintage With Elderflower Festive Bauble, 6.3 oz. Molton Brown LHT107 - London via bolivia enriched with indian cress extract and amino acids, hair is thoroughly nourished and the scalp is refreshed delicately fragranced with enticing aromas of jasmine, honeysuckle and sandalwood. An irresistible trio of baubles, aglow with oak-aged rum, fiery pink pepper and warming allspice in our most intoxicating bathing fragrances.
. For: all hair types the ultimate curated bathing gift featuring 10 of our most-loved fragrances, elegantly presented in a festive gift box. Molton Brown Nurturing Shampoo with Cloudberry, 10 fl. oz. Molton Brown Glossing Shampoo with Plum-Kadu, 10 oz. Molton Brown Repairing Conditioner with Papyrus Reed, 10 fl. oz. Molton Brown MBC806 - A pampering trio of bath and shower gels infused with enduringly feminine aromas. An irresistible trio of baubles, aglow with oak-aged rum, fiery pink pepper and warming allspice in our most intoxicating bathing fragrances. Intoxicating poofs of scented glitter swirl through a merry middlemen of festive aromas. Magic-filled boxes wrapped in sparkling ribbon, ready to reveal curious infusions hidden inside. The surprising spirit of christmas, brewed with a bang! The ultimate curated bathing gift featuring 10 of our most-loved fragrances, elegantly presented in a festive gift box. Let her luxuriously unwind with a beautiful collection of heavenly bathing moments. Molton Brown Divine Moments Bathing Gift Set, 48.1 oz. - Includes:300ml relaxing ylang-ylang bath & shower gel300ml fiery pink pepper bath & Shower Gel300ml Rosa Absolute Bath & Shower GelEXPLORELondon via The Festivities Make joyful mayhem in the Molton Brown Christmas Distillery. Molton Brown Nurturing Conditioner with Cloudberry, 10 fl. oz.